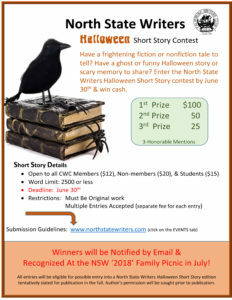 North State Writers invites all CWC writers and authors to submit their original fiction or nonfiction horror tales, or humorous, fun Halloween stories. Deadline is June 30, 2018. For submission guidelines please see northstatewriters.com. or contact Kathy Hiatt, branch president.